Gabriel, K. R. 1971. The biplot graphic display of matrices with application to principal component analysis. Biometrika 58:453-467. --This is the first paper where biplot was described. Kroonenberg, P.M. 1997. INTRODUCTION TO BIPLOTS FOR GXE TABLES. Yan, W., Frégeau-Reid, J., Pageau, D. and Martin, R., 2016. Genotype-by-environment interaction and trait associations in two genetic populations of oat. Crop Science, 56(3), pp.1136-1145. Yan, W., 2015. Mega-environment Analysis and Test Location Evaluation Based on Unbalanced Multiyear Data. Crop Sci., 55(1), pp.113-122. ﻿Yan, W. 2013. Biplot analysis of incomplete two-way tables. 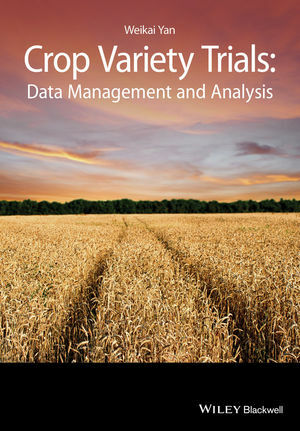 Crop Sci. 53:48-57. ﻿Yan, W. 2011. GGE Biplot vs. AMMI Graphs for Genotype-by-Environment Data Analysis. Journal of the Indian Society of Agricultural Statistics, 65(2): 181-193. Yan, W., Pageau, D., Frégeau-Reid, J.A., and Durand, J. 2011. Assessing the Representativeness and Repeatability of Test Locations for Genotype Evaluation. Crop Science, 51(4): 1603-1610. Yan, Glover, Kang, 2010: Statistical test of biplot patterns. Yan, W. and Holland, J.B. 2010.. A heritability−adjusted GGE biplot for test environment evaluation. Euphytica, 171(3): 355−369. Yan, W and J. Fregeau-Reid. 2008. Breeding line selection based on multiple traits. Crop Sci.48:417-423. Yan, W., M.S. Kang, B-L Ma, S.Woods, and P.L. Cornelius. 2007. 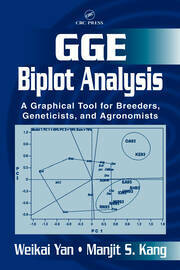 GGE Biplot vs. AMMI Analysis of Genotype-by-Environment Data. Crop Sci 47: 643-653. Yan, W., and N. A. Tinker. 2006. Biplot analysis of multi-environment trial data: principles and applications. Can. J. Plant Sci. 86: 623–645. Yan, W and N. A. Tinker. 2005. A biplot approach to the investigation of qtl-by-environment patterns. Molecular Breeding 15:31-43. Yan, W. and D. E. Falk. 2002. Biplot analysis of host-by-pathogen interaction. Plant Disease 86:1396-1401. Yan, W., L. A. Hunt, Q. Sheng, Z. Szlavnics. 2000. Cultivar evaluation and mega-environment investigation based on GGE biplot. Crop Sci. 40(3): 597-605. This is the first paper where the term "GGE biplot" appearred and GGE biplot graphs described.